I'm popping in really quick to share a few sale alerts and mini reviews with you -- they're just too good not to share! First, I want to highlight the Kate Spade Summer Sale event, where all sale items are now an additional 30% off with code "SUNNY" now through Wednesday, July 5th. All items ship for FREE within the U.S., too (with free returns)! 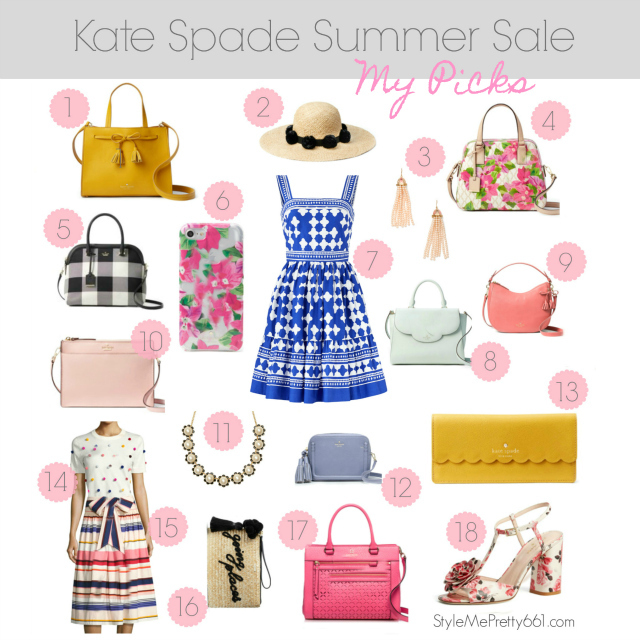 From pretty sundresses to colorful handbags and fun, whimsical accessories that are notoriously Kate Spade, there's always something of hers on my wish list. Thankfully for my wallet, a few of the things I've been eyeing for some time are now included in this sale, so my patience has finally paid off! I finally pulled the trigger on this Lantern Poplin Flounce Dress (#7 above.) The striking cobalt-blue and white color combo, the intricate tile pattern, the square neckline -- there's just so much to love about this dress! It's a gorgeous, cotton, fit-and-flare dress with a hint of stretch, perfect for all Summer events. I can't wait to wear it! I sized up based on the online reviews and ordered a size 0. (Note: the smallest size available is size 00, which runs really small in the bust at only 31.5" and measures 24" at the waist and 34" in the hips. By comparison, the size 0 measures 32.5" in the bust, 25" in the waist, and 35" in the hips. If you have a larger bust, you may wish to size up 1 - 2 sizes.) I'm hoping it fits since it's final sale. Valid in the U.S. only. *Free shipping with no minimum is a rarity at Ann Taylor, so take full advantage of it while it lasts! My beloved blush tassel suede sandals that I wear all the time are now only $88.80! They come in a light grey option and a black option, too. They're super comfy and add a pretty pop of color with everything from skirts, dresses, and jeans. This classic, striped pencil skirt is a great option to just throw on and go. Dress it up for the office with a drapey blouse and pumps or dress it down with a casual tank and wedges -- you can't go wrong either way. It's a nice, stretchy fabric and has a good weight to it, so it's both flattering and forgiving. It's a pull-on style, so no fussing with zippers, which is always a plus. The stripes look black in the photo, but they're actually navy, which pairs well with multiple other colors. It's now only $41.99. How beautiful is this "jungle floral" print? The colors are even more vivid in-person. This skirt is truly a stunner and one I've already worn countless times. It's another Summer staple that looks lovely with a blouse, blazer or pumps for the office or with a simple tank or chambray top and sandals for the weekend. Love it to pieces and it's now only $29.99. *Free shipping with no minimum is also a rarity at LOFT, so take full advantage of it while it lasts! If you're loving all things yellow right now like I am, you need this shell stat. It instantly brightens up any outfit and, in turn, your mood. Yellow just has that kind of effect, right? The small dots on this blouse make it even cuter. I've worn this blouse with flair skirts (as styled above) and white jeans and love both pairings. Add a pair of cognac wedges or turquoise block-heeled sandals and you have another easy-breezy Summer look. Snag it for only $17.99. This painterly dress was an unexpected fitting-room favorite. Initially, I wasn't drawn to it when seeing it on the hanger, but after trying it on, I ended up taking it home with me. It's a darling shirt-dress style that ties at the waist, but what really sold me on it were the pockets (of course) and the fact that I could slip it on and off over my head without having to unbutton it at all -- that's a win in my book. The belt cinches the waist and it gives it a flattering shape, and the fabric is lightweight. (Note: one small caveat is that it's not cotton, but rayon, so to avoid possible shrinkage, I suggest you dry-clean it.) Add sandals and an optional cardi or denim jacket for when it gets chilly, and you're set. Snag it while sizes remain for only $38.93. Stock is very limited. Who doesn't love a pretty toile? It always reminds me of vintage china (which I collect) or beautiful French countryside linens/textiles. I adore this one in its soft shade of red, which actually looks like a cross between red and pink. It's perfectly feminine and flowy and is one of those pieces that looks darling on everyone I've seen it on. (See it HERE on Jess of What Jess Wore.) It's a modest midi length, which I love, and drapes beautifully on the body giving it an ethereal quality. It's a total steal at only $50.93. Get 30% off everything + FREE shipping when you spend $30 or more today only (no code needed.) Valid online only and standard ground shipping within the U.S. only. Sale excludes clearance and beauty items. Charlotte Russe? Wait, what? I know! I rarely shop at these trendy-fashion or junior-style stores, so no one was more surprised than I was to recently stumble on a few gems there, but lo and behold, they've become immediate favorites and actually fit me well right off the rack -- who knew? 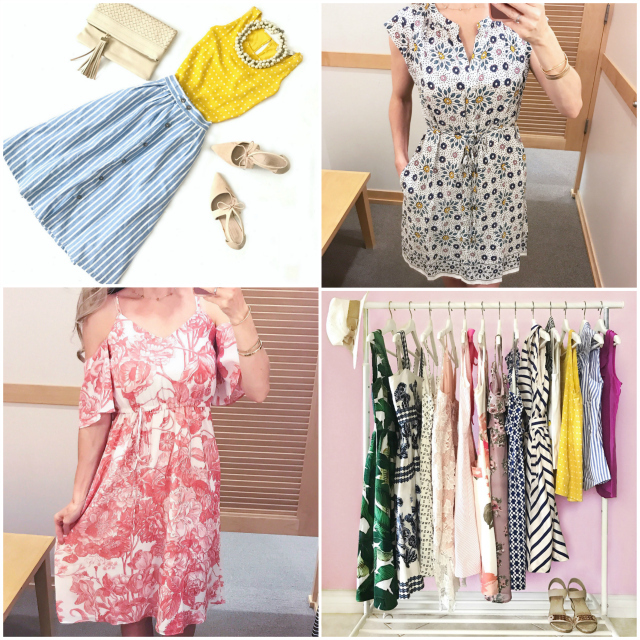 I shared a few cell phone snaps of them last week on Instagram and in my Instastories and wanted to post them here, too, in case you're looking for a few inexpensive items to add to your Summer wardrobe. This crochet lace dress is, in a word, amazing and now only $23! The fit is super flattering, showing all the right curves while still holding an element of sophistication. The floral lace is what captivated me, and I'm pleased to say that it's of good quality, too. It's easy to slip on and off with a side-zipper closure, and is fully lined to about mid-thigh length, allowing the lace to peek through at the hem, which I love. The back of the dress dips down a bit, but I managed to push my regular bra band down to conceal it without any problems. This dress will be on heavy rotation for all my dressy Summer events, believe me. This floral ruffle dress was another pleasant fitting-room surprise, and at only $21, I didn't even hesitate. I adore the lilac florals and the ruffled neckline and sleeves -- so very pretty! Size small is a little big on me in the waist, but doesn't deter me since this dress style is meant to be airy and flowy. 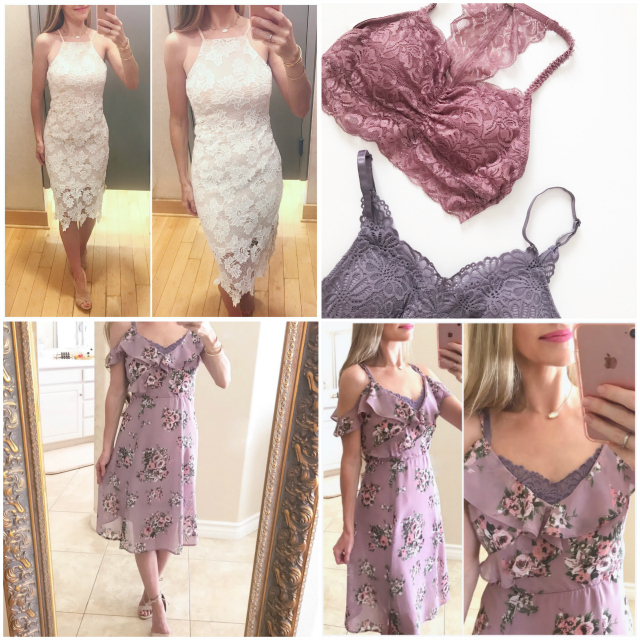 The neckline is a little low, even after adjusting the spaghetti straps, so I picked up a few of the lace bralettes in similar mauve and lilac hues to pair with it. It's such a romantic look! 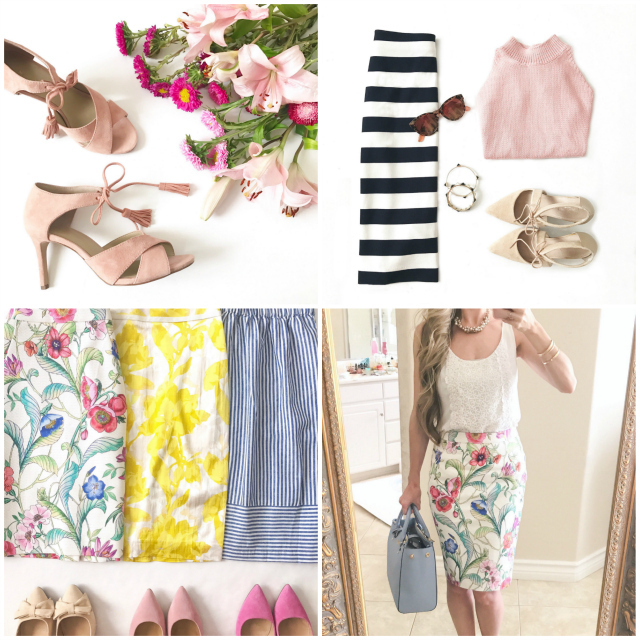 Also, if you've been on the hunt for a few pretty flare skirts or tulle skirts, be sure to scroll through the below sale picks because I've spied some that are definitely worth checking out! If you're not a cardholder but want to become one before the sale begins, click HERE to apply and once you're approved, you'll receive a $20 Nordstrom Note to use during the sale. There are always a ton of goodies worth checking out during the sale, especially new arrivals and N-Sale exclusives, so be sure to stay tuned! You'll want to prepare in advance and hopefully snag your favorite items before they sell out from under you! Sneak a peek of the N-Sale catalog HERE! I hope you found these helpful! Happy browsing/shopping, and enjoy the rest of your day!